What is the course sequence for middle grades and high school? How do the CCSS Math 8 and CCSS Algebra 1 courses compare to the old Algebra 1 course? Is CCSS Math 8 the same as the old 8th grade Pre-Algebra course? Can students skip CCSS Math 8 and go straight into CCSS Algebra 1? Will students still be able to take AP Calculus in high school? This is the course sequence adopted by the SFUSD Board of Education in February, 2014. The SFUSD math course sequence ensures a solid middle-grades foundation that not only supports all students to successfully meet the UC “c” requirement, but also prepares them for college mathematics. Having one core sequence provides focus and coherence as schools and teachers implement the CCSS-M and supports equity by creating a path for all students to experience rigorous mathematics. Different high school course-taking options are shown on our High School Mathematics Pathways page. Read more about our Secondary Course Sequence. 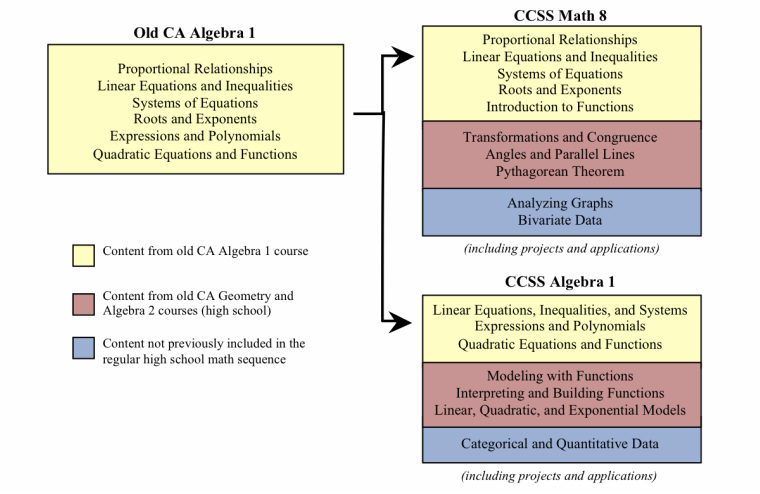 The standards that defined an Algebra 1 course under the old California standards are now divided between the CCSS Math 8 course and the CCSS Algebra 1 course, as shown below. CCSS Math 8 and CCSS Algebra 1 courses also include content from more advanced high school courses and concepts not previously taught in high school math, especially statistics. No. CCSS Math 8 is much more rigorous than the 8th grade math courses of the past, and covers many standards that used to be part of Algebra 1. The old Pre-Algebra course primarily reviewed standards taught in earlier grades—fractions, decimals, and percents, ratios and proportions, equations, and geometric measurement—which remain the focus of Common Core courses in earlier grades. The content of CCSS Math 8 is based on standards from three main domains: Algebra and Functions (about 65%), Geometry (about 25%), and Statistics (about 10%). No. CCSS Math 8 introduces extensive new mathematics content and is not a course that can be skipped. The content of the middle grades course sequence (CCSS Math 6, CCSS Math 7, and CCSS Math 8) is essential for preparing students for both CCSS Algebra 1 and CCSS Geometry in high school. The authors of the Common Core developed an intentional vertical connection of algebraic and geometric topics from grades K–8 through high school. CCSS Algebra 1 builds on the content students learn in CCSS Math 8 and does not repeat content from CCSS Math 8. CCSS Algebra 1 is also much more rigorous than the old CA Algebra 1. It assumes students have already worked with linear equations and functions and then extends their study of non-linear functions to include quadratic and exponential functions—topics that were introduced in Algebra 2 in the past. CCSS Algebra 1 also includes a significant focus on statistics and applying algebraic tools to solve complex, real-world problems. 9th graders in SFUSD are automatically placed into SFUSD’s 9th grade math course, CCSS Algebra 1. However, some students have taken an Algebra 1 course outside of SFUSD before 9th grade. If your child will be entering 9th grade and has completed, or is in the process of completing, a full-year Algebra 1 course either in their middle school or at an accredited high school or college, and they wish to be considered for placement into CCSS Geometry in 9th grade, they may be eligible to take the Math Validation Test (MVT). Course content and providers must be reviewed and approved by SFUSD in order to be eligible. Courses are evaluated ​after applicants submit their coursework documentation. This test is not required; only students who wish to take Geometry as freshmen need to take it. Yes, by doubling up or compressing courses in high school. Due to the essential nature of all CCSS courses, students can no longer accelerate in math by skipping a course. The secondary course sequence includes the option to accelerate in high school by compressing CCSS Algebra 2 with Precalculus into a one-year course. Another option is to double up in math courses during one year of high school. You can see graphical representations of different options on the High School Mathematics Pathways page. Students have the following options to progress to AP Calculus in their senior year. Contingent upon funding, students may be able to complete a full year of CCSS Geometry during the summer between their freshman and sophomore years. In either Option 2 or Option 3 above, Geometry is the course that can be “stacked” with another course since the content of Geometry is reliant on CCSS Grade 8 Math, not Algebra 1, and Algebra 2 does not rely very much on Geometry content. Students can also take a different AP course, AP Statistics, after successfully completing Algebra 2. ​Have other questions? Contact us!